The Faculty Development program at STEPS provides many opportunities for enhancing the teaching and scholarship activities of faculty from all disciplines. Three days of simulation instruction and activity are available in the Simulation Certificate Program. Hands-on experience. Cutting edge technology. When it comes to patient care, experience is everything. 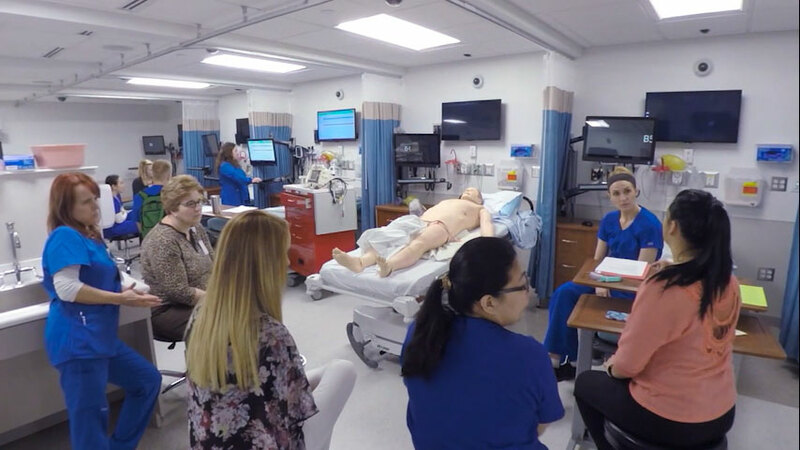 With the West Virginia Simulation Training and Education for Patient Safety center, our students are learning life-saving procedures, developing interprofessional communication skills, and using new technologies, before they get into patient care environments. The David and Jo Ann Shaw STEPS center houses patient simulators ranging from premature babies to adults, including ultrasoundable models. State of the art technology – and a highly adaptable simulation set from student learners to hospital professionals – fosters analytical, diagnostic and communication skills. WV STEPS is a premier simulation center that provides experiential learning to health care professionals to improve their skills. Inter-professional education is highlighted as nurses, pharmacists, physicians, and other members of an integrated healthcare team train together as they will work in the healthcare setting. Integration enhances the educational experience for all professions involved. Simulated crisis scenarios expose trainees to uncommon, high-risk conditions in the safe environment of the simulation center. Improved patient safety is the ultimate goal. These simulations allow me to get feedback from both patients and professors. Without these simulations, I would not have this valuable experience prior to working with patients as a licensed pharmacist. WV STEPS delivers innovative inter-professional healthcare training, using technology to enhance education as our Center helps clinical learners improve their analytical, diagnostic, communication and crisis-intervention skills. Customized clinical experiences are tailored to the level of each learner, from students to healthcare professionals. The Center uses a variety of patient simulators capable of everything from trembling and crying to bleeding or giving birth. Manikins and trainers give clinicians the opportunity to learn, rehearse, and perfect skills from the simple to the highly complex. Diagnostic and therapeutic procedures are learned and mastered to improve patient care. Our students are using augmented reality tools, such as Microsoft's Hololens, to get a deeper understanding of health care practices. These tools allow our students to get hands-on with a variety of complex medical procedures before they're in a patient care environment. Advancements in education through technology and research are products of strong philanthropic partnerships. Individuals, corporations, and foundations with a vision for innovations in healthcare for the creation of healthier communities are integral to the development and growth of our programs. The faculty, staff, and patients of WVU Medicine appreciate our donors’ vision and support. 26,000 educational encounters in 2017. A Standardized Patient is a real person role-playing a realistic clinical situation to help healthcare students learn and/or evaluate clinical skills. They are people from the community who have indicated an interest and are accepted based on their communication skills. © 2018 West Virginia University. WVU is an Equal Opportunity/Affirmative Action institution — Minority/Female/Disability/Veteran.